Will The NRA Save Nancy Pelosi’s Job? Political analysts’ have been predicting a rough time for Democrats in the mid term election, but at the last moment they are receiving a glimmer of hope, this time from the NRA. The NRA may think supporting a few Democrats will save them, but there is NO evidence that a Pelosi lead House will be friendly to a pro-gun agenda. The current political makeup of the House is 255 Democrats, 178 Republicans and 2 Vacancies. The Republicans will need to pickup 40 additional seats for the GOP to take control of the House. The NRA has currently endorsed 58 House Democrats. Over a dozen of these Democrat held seats are considered critical to the GOP if they are to take control of the House. The NRA claims to be a nonpartisan, one issue organization with an incumbent friendly policy and has endorsed Democrats in the past. The NRA rates incumbents primarily on their voting record of NRA endorsed legislation where as groups like Gun Owners of America rates politicians based on their willingness to support and introduce pro-gun legislation and their overall support of liberty. This incumbent friendly policy is causing some to question the NRA, because it may save an anti-gun majority in the House. It also appears the NRA has a “my way or the highway” philosophy when it comes to supporting candidates. Ron Paul has a history of being an opponent of the federal expansion. In 2003 Paul introduced H.R 153 the Second Amendment Restoration Act. The bill sought to repeal the instant background check, the assault weapons ban and delete the “Sporting Purposes” test from the 1968 Gun Control Act. Had H.R. 153 become law it would have been the most important pro-gun legislation in the last 50 years. In the end the bill was DOA. By April, 2003 the NRA threatened to pull ALL support from Ron Paul because he refused to support an NRA backed bill that he believed would expand federal power over the states. With the decision to support so many democrats for re-election the NRA has apparently decided to maintain the status-quo. I am not saying Republicans have all of the answers; after-all they promised to repeal the Brady Bill and restore integrity to our government in 1994. The issue becomes who will be in control of the reins of power. 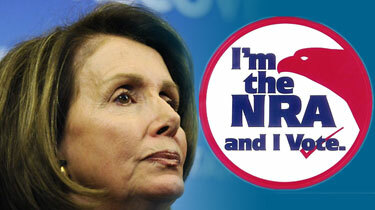 House Speaker Nancy Pelosi (D-Calif.), is one of the most anti-gun, ultra left speakers in the History of the House. If the Democrats hold on to power she will decide what bills come to the floor and can crack the whip to keep her party in line at anytime. Our Rights are under attack; our nation is collapsing under a mountain of debt and corruption and this current round of NRA endorsements has more to do with saving the NRA than saving our Country.